This week, Science for the People is exploring the ways human-made environments support – and shape – the lives of many species we think of as vermin. 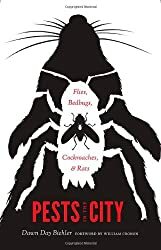 We’ll talk to Geography and Environmental Studies Professor Dawn Day Biehler about her book Pests in the City: Flies, Bedbugs, Cockroaches, and Rats. We also speak to postdoctoral researcher Clint Penick about his research on the junk food diets of urban ants. This entry was posted in Curiosities of Nature and tagged ants, bedbugs, Clint Penick, cockroach, Dawn Ray Biehler, flies, Peer-Reviewed Literature, pests, Pests in the City, Podcast, science for the people, University of Washington Press. Bookmark the permalink.